Eastwind diamond dot hand pads are light weight but strong. They are designed to be used for the easy finishing of shapes and areas that are hard to reach with power tools. The hand pads measure 100mm long, 55mm wide and are 27mm deep and are made from excellent quality high density foam. The diamond dot hand pads are manufactured in 60 mesh through 1,800 mesh. All the prices for the various meshes are the same cost except for 80 grit and coarser - these are approximately 10% more expensive. 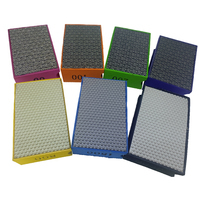 We currently stock the diamond dot pads in the following grits: 280, 600, 800, 1200 and 1800. For grits finer than 1800, the hand pads come with a resin bonded surface. We don't hold them in stock, however it doesn't take long to order them in.